I am a big supporter of water fountains for pets. I tried out the Catit Fresh & Clear Drinking Fountain a short time ago and here are my thoughts on this product. As all pet owners know, your cat requires a good supply of clean and fresh drinking water. The CatIt Fresh & Clear Drinking Fountain is designed with this in mind. It is a water station that constantly re-circulates water and keeps it moving at all times. This recirculating keeps water exposed to oxygen and therefore keeps the water tasting fresh and not stale. This means that water also remains cool due to this circulation. This fountain does come with a food bowl which is luckily detachable. Personally, I do not like food bowls directly next to a water bowl. If you keep the food bowl attached you will find that pieces of food get into the water bowl – not very nice. Therefore, I would advise you to detach the food bowl before setting up. The first thing to notice about this water fountain is that it does have a really cool looking design. It has a large blue coloured dome that fits over a water pool and it holds a large 100 fluid ounces of water. It does though take up a bit more space than other fountains due to the large size of this dome. Setup is not difficult. The motor is placed into the base water bowl which is filled with water. Pop in the charcoal filter which is shaped to fit the bowl and then fill the dome with water. The dome can be filled by tipping it upside down, filling all the way from the tap and then turning back round. A plug will then stop the water from escaping. 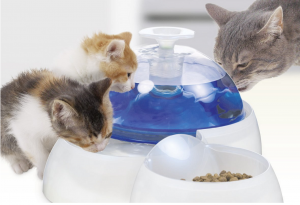 Place the dome on top of the water bowl and then switch on – that is it. You should now have a cascade of water freely running over the entire surface of the dome. If water runs down in rivulets then first make sure that the water bowl is on a smooth surface – an unsmooth surface doesn’t allow the water to run smoothly and the motor makes more noise. If the water still doesn’t cascade smoothly down the side of the dome then massage the dome gently which creates static to help the water flow. How Will your Cat Use it? Probably the most important question. Using this water fountain for kitty is very simple and gives them a number of options. They can either lick water directly from the dome or drink from the large pool. 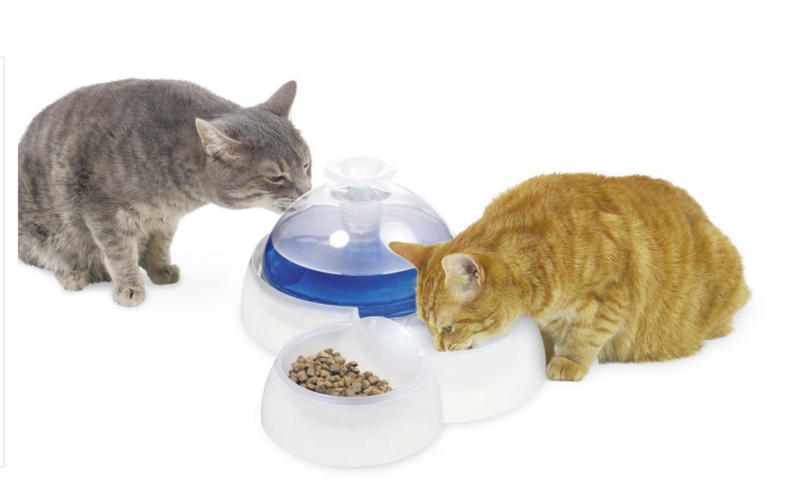 The dome is large enough as well for two or more cats to drink directly from it – a bonus in a multi-cat household. Overall my cats loved drinking from this. My older cat used to prefer drinking from the actual bowl but Dyson used to prefer drinking from the top of the dome (she really does not like bending over to drink her water). The filters though do work as expected, they trap debris and dirty particles and should be changed about once a month. They should also be run under hot water about once a week to remove dirt build up. Clean up is a little more time consuming than some other fountains. Once a week the bowl and dome should be rinsed out along with the filter. The dome does need to be given a wash over due to the build up of saliva that can mean the water cascade does not work as well as expected. Once a month it should then have a deeper clean. The motor should be removed and it can be cleaned to get rid of any build up of dirt and other muck (using a toothbrush (an old one!) will help remove deposits). The dome should also be cleaned inside and out though cleaning the inside of the dome can be tricky. The filter should then be changed (filters do come in a pack of three for about $5 so they are not expensive). 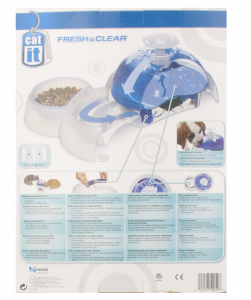 Overall my cats loved using the Catit Fresh & Clear water fountain. The water remained fresh and clear all day long and also stayed pretty cool – even in hot summers. As the fountain holds a large amount of water I found that it only needed topping up once a week – so perfect for multi-cat households. As it is big it does take up quite a bit more space than the more compact drinking fountains though. I did find the attached food bowl a little useless – filling with dried food meant that more often than not bits of food ended up in the water bowl. Luckily it is detachable. Clean up I did find a bit onerous. Whilst just rinsing out the cat fountain was simple, at least once a month I had to do a full strip down of the fountain and clean up the motor – which can be a messy task. I also found that quite often water would also start running down the dome in rivulets rather than a nice cascade so I had to keep massaging the dome. The water would then start cascading properly again only for it to then start running in rivulets about an hour later. I am not sure if this was because my floor was not completely smooth. Sometimes motors do blow on these units (I lost a motor after just over a year of use). However, replacement motors can be bought quite easily and are not expensive. One really nice thing about this water fountain though was that it also had a plastic cord guard – absolutely great if your cats like to chew wires. This was a thoughtful addition as most fountains just have standard electrical cords with no guards. Massaging the dome to get water cascading can get tedious. I love water fountains and the CatIt Fresh and Clear is a good addition to this list. It does look cool though as well as being very useful. You can buy this today from Amazon at a great price of about $30, just click here. If you want to see our review of another water fountain, then we try out the Cat Mate Pet Fountain here. Take a look and then decide which you prefer. Evie, I love the water fountain for cats and the price is great for the purpose. I truly love the idea of clean water for the entire day. I remember not liking the look of my cats’ water after I spent a long day at work. Wish I knew about this then. Great post and love your site. Thanks for informing. I agree that water left out all day can look dirty – cat hair gets in it. These fountains all filter that stuff out. I have even got my mother interested in getting one. My cat actually has one of these! He love is haha. And you’re right about the cleaning part, that’s no fun at all. But it’s totally worth it. I highly recommend it, and so does my cat! 🙂 Thanks for a great post! I’ve browsing around the internet for cool cat things and wishing I had a cat to buy cool gadgets for. I like this cat water fountain alot based on your description. Thank you for sharing! Thank you for your comment – glad you like the description of this. This is a really thorough review Evie. Nice job! If I had a cat I would definitely buy one of these. Do they make a version for dogs? That’s pretty cheap for a drinking fountain! Usually the higher quality ones I expect to be greater than $50. Do you think that those are overpriced? Honestly I think that around $30 is a very good price to pay. As a lot of quality water fountains are priced around this point I think a water fountain that is retailing for $50 needs to be very special indeed. This is an excellent idea for all cat owners. I’ve always had trouble getting my cats to drink enough water and stay hydrated. They seem to prefer drinking water which they are not really supposed to drink (such as water from a pond or fish tank) This would probably encourage better water consumption. Really neat. 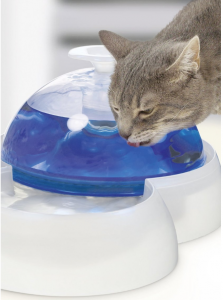 An all in one place where your cat can eat and drink! Does it work for dogs also? Great site! Simple clean and cat lovers seem to have found a great water dish because of you..Very cool Great 1 item website I think. This drinking fountain is so cool! I think I would get one if I have a cat. Having clean and fresh tasting water for our pets is a great idea. I too don’t fancy the cleaning part. Thanks for the thorough review! Thank you – yes pets need clean and fresh drinking water. It’s so important for their health and well being. Evie, you touch on all the bases regarding what’s required for the care of a person’s cat. A person can find all the valuable information and items needed right here on your site. I was just looking at my cat’s scratching post and was thinking, “he’s getting a lot of use from it because it’s in shambles.” He’s 14 years old. You’re true to your sites heading;.. Cool toys, gadgets and stuff for your cat. Evie, your website has it all!